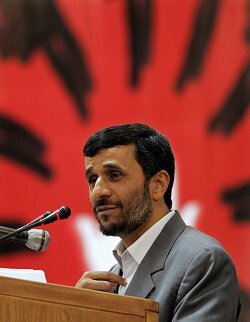 It has been a while since Iranian President Mahmoud Ahmadinejad has shocked the media with another fiery speech. And while many critics remain skeptical about the importance of the apparent reduction in Ahamdinejad's appearances, others believe that the dissatisfaction of Iran's Supreme Leader Ayatollah Ali Khamenei regarding the handling of political, and most importantly economic, issues has silenced the young president to a considerable extent. Supporting the latter hypothesis are the voiced concerns that have been increasingly expressed among the top-ranking officials of Tehran over Ahmadinejad's policies. According to the traditional hierarchy of power within the Islamic Republic, it seldom occurs that prominent government figures openly criticize the general direction of the country, especially regarding key issues such as nuclear energy, unless given a nod from the leadership. The Supreme Leader himself, following an unwritten rule, rarely focuses his speeches directly on the details of current affairs, and tries to stick to the moral advises and fundamental mottoes of the Islamic Republic. Among the general populace, the sharp rise in prices and a decreased standard of living in Iran during Ahmadinejad's presidency has made his policies unpopular, especially since it was his economic promises that strongly assisted him in the ascension to office. Recently, there have been a number of large protests by workers and employees over their low or delayed wages. This economic failure has brought candid criticisms from well-known figures within the Islamic Republic. Head of the powerful Expediency Discernment Council Akbar Hashemi Rafsanjani warned Ahmadinejad's government that the "deadline of government" in regards to its economic promises had ended. All members, including the head of the Council, which serves a consultative function to Ayatollah Khamenei, are directly appointed by the Supreme Leader. Rafsanjani also added that during a meeting with the Khamenei, which took place after the ascension of the new government, he was reviewing the budget and noted that, "points could be seen that did not match the basic policies, but we decided to give some time to the government in order to apply his plans." In an interview with the French daily Le Monde, Ayatollah Yoosef Sanei, one of Qom's prominent clerics and once a close ally of Ayatollah Khomeni, the leader of the Iranian Revolution, also criticized the economic policies of Ahmadinejad's government stating that, "they promised to put the oil income on people's plates, but now they are taking the money out of people's petrol tanks," alluding to the increase in the price of petrol. Iran's nuclear program is the other key issue in the Islamic Republic, and its handling by the government has lately been subject to verbal attacks from powerful figures. Unlike Ahmadinejad's initial bold statements, which faced no negative reaction inside the country, his recent speeches regarding the nuclear program have brought sharp criticisms. Last February, in reaction to one of Ahmadinejad's fiery remarks stating that the "train" of the nuclear program was proceeding "without brakes and a rear gear," Rafsanjani warned the government about the consequences of shutting their eyes to the West's ire, asserting that, "the angry foe cannot be ignored." At the same time Dariush Ghanbari, a member of Parliament's National Security Commission, criticized Ahmadinejad's remarks as "unprofessional" and "emotional," adding that such statements harmed the national security of the nation. Another parliamentarian, Nooroddin Pirmoazzen, asked for a more effective role for the pragmatist conservatives such as Ali Akbar Velaiati and Ali Larijani, who would be placed under direct supervision of the Supreme Leader regarding the nuclear case, suggesting also a ban to prevent "others" from interfering with the issue. Former reformist president Mohammad Khatami, who during his presidency had accepted the International Atom Energy Agency's request to halt the uranium enrichment, has also in various cases voiced his concern over current government policy. "We have to pay a price for going nuclear and starting negotiations," said Khatami after the adoption of the United Nation's sanction-imposing Resolution 1737 against Tehran's nuclear activities, indirectly referring to the West's request regarding an enrichment freeze as a precondition to begin negotiations. Hossein Moussavian, a former member of Iran's nuclear negotiating team led by the moderate Hassan Rohani, also advocated a policy of "flexibility, caution and patience" in order to "create trust, remove ambiguities, respond to questions from the International Atomic Energy Agency and negotiate." Some experts believe that at this point there might be some pressure on the Supreme Leader to "do something" about Ahmadinejad. "Khamenei is the key figure in the question of what to do about Ahmadinejad," said Ali Ansari, an Iran analyst with the London-based think tank Chatham House, in an interview with Radio Free Europe / Radio Liberty. "I think in the first instance, they will just try to contain and control him. If they can't contain and control him and he keeps shooting his mouth off, I'm not sure what will happen. Clearly there will be a lot of pressure on the Supreme Leader to take some more decisive action." One indication of some distance between Ahmadinejad and Ayatollah Khamenei was broadcast by the daily newspaper Jomhouri-Eslami, which is known to reflect the views of the Islamic Republic Supreme Leadership. The paper has rejected Ahmadinejad's sarcastic comment that the United Nations' resolution against Iran was merely "a scrap of paper," noting that to the contrary "the sanctions will certainly hurt Iran, and that it's not right to dismiss them lightly." Although due to the various layers of power in Tehran, predicting the future leanings of the country's policies seem almost impossible, shared concerns over the consequences of current government's political approach has led to the formation of an unprecedented coalition among once rival reformists and pragmatist conservatives, and has recently resulted in a relatively emboldened stance for such figures. Recently Akbar Hashemi Rafsanjani's brother, Mohammad (a conservative politician himself) told Iran's Aftab News Agency that the three prominent opponents of Ahmadinejad's policies, Khatami, Rafsanjani and the chairman of Iran's Parliament during Khatami's presidency, Mehdi Karroubi, are about to form a coalition prior to parliamentary elections in 2008.